The popularity of Angry Birds continues to amaze me. First launched on December 11, 2009 the game became Apple store’s biggest hit of 2010. Since then it has been downloaded on numerous platforms over 1 billion times. Who knew the world would become so enamored with the story of angry birds battling the greedy green pigs who had stolen their eggs. 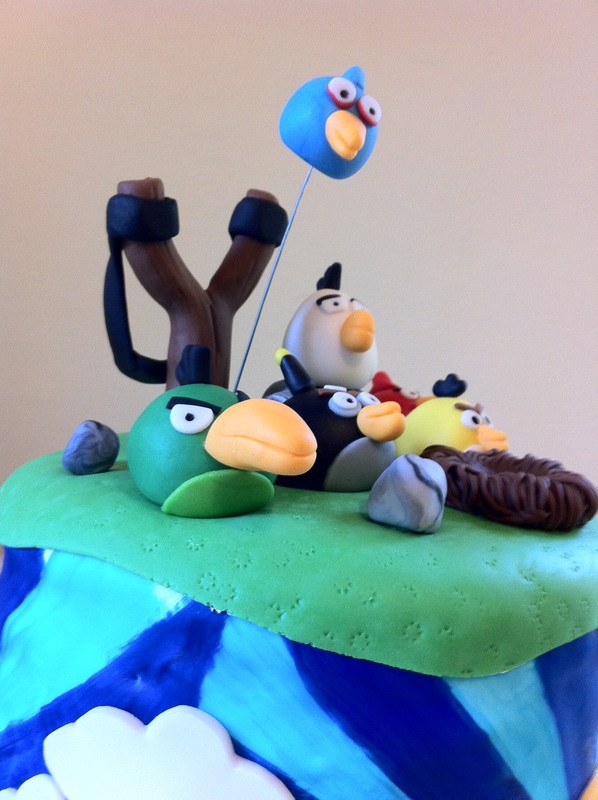 Fast forward 2.5 years and I receive a call at my cake shop for an Angry Birds birthday cake. Let me tell you about it. 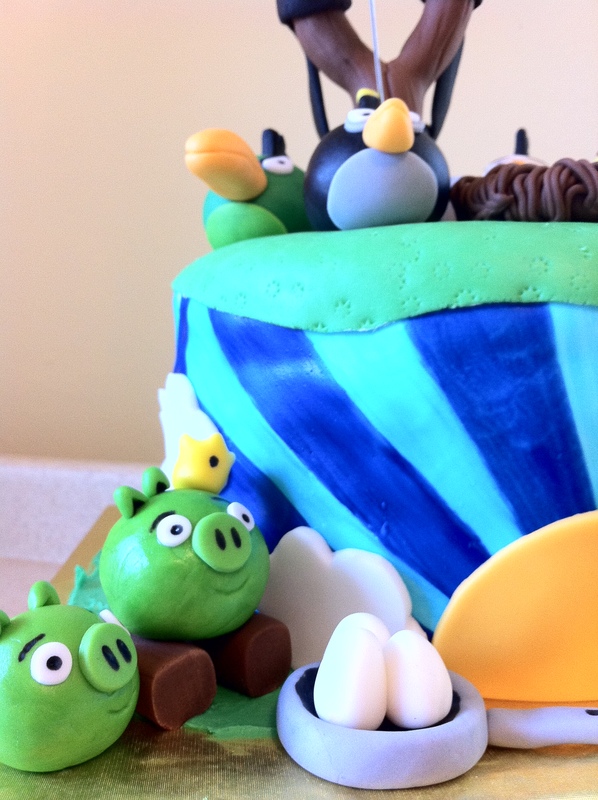 It was for a little boy and his father who are both obsessed with Angry Birds. The mother bought in a picture she found online and I adpated it to make it my own. Incorporating the various colored birds from the game (green, red, white, blue, black, yellow), the slingshot, and the evil green King pig and his minions. The most challenging part for me was to try to capture the sunrise from the game. I thought of using 2 layers of fondant to capture the color but ended up choosing to paint the cake instead for this. 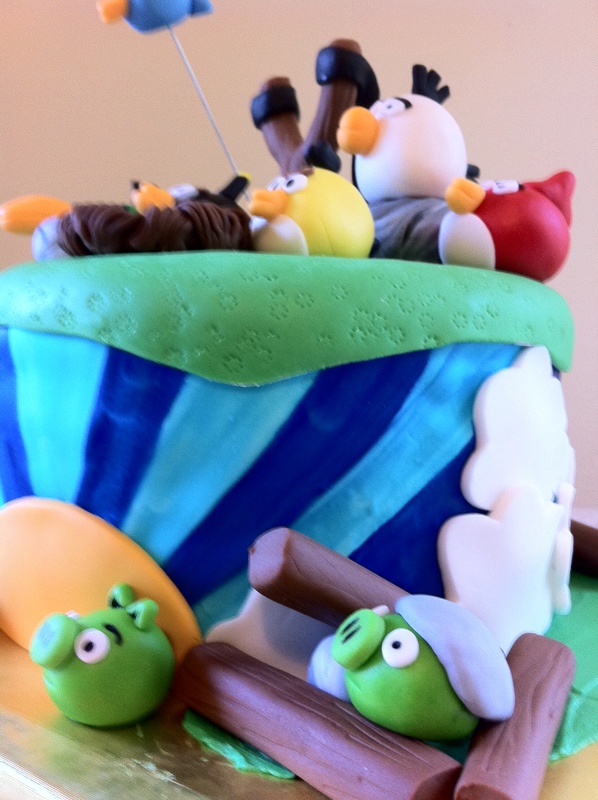 Angry Birds cake – the green pigs with the stolen eggs. « Supreme Pizza birthday cake with all the toppings!! I believe this is one of new favorites…… When are you going to do some of the other Apple games like “Draw Something” or from movies like “the Hunger Games” or “the Aveners”? Love this cake!!! Wish you could deliver cakes up to Knoxville, TN….. love your work!!! Your scuplted characters are so CUTE!!!! You could make a TV show with this kind of work!